Introduction. Turbulent Flows with Chemical Reaction. Turbulent Flames. Smoke Plumes. Fire Dynamics in Enclosures. Smoke and Heat Control. The Effect of Water. Computational Fluid Dynamics. Prof. Bart Merci obtained his PhD, entitledNumerical Simulation and Modelling of Turbulent Combustion', at the Faculty of Engineering at Ghent University in the year 2000. As postdoctoral fellow of the Fund for Scientific Research - Flanders (FWOVlaanderen), he specialized in numerical simulations of turbulent non-premixed combustion, with focus on turbulence - chemistry interaction and turbulence - radiation interaction. 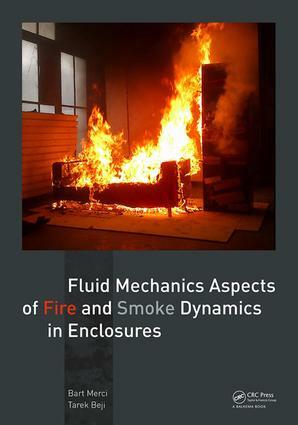 He reoriented his research towards fire safety science, taking the fluid mechanics aspects as central research topic. He became lecturer at Ghent University in 2004 and Full Professor in 2012. He is the head of the research unitCombustion, Fire and Fire Safety' in the Department of Flow, Heat and Combustion Mechanics. Since 2009, Bart Merci coordinates theInternational Master of Science in Fire Safety Engineering', with Lund University and The University of Edinburgh as partners. He has been the President of The Belgian Section of The Combustion Institute since 2009 and Associate Editor of Fire Safety Journal since 2010. He is member of the Executive Committee of the International Association for Fire Safety Science. He is author of more than 100 journal papers. Dr. Tarek Beji obtained his PhD, entitled "Theoretical and Experimental Investigation on Soot and Radiation in Fires", at the University of Ulster in 2009. He joined Ghent University in 2011 as a post-doctoral researcher in the department of Flow, Heat and Combustion Mechanics and worked on the novel topic of fire forecasting. Since 2012 he has been very active in a large international collaborative research program called PRISME, focusing on mechanical ventilation and fire dynamics in nuclear facilities. Since he joined Ghent University he participated actively in the 'International Master of Science in Fire Safety Engineering' as lecturer and member of the program steering committee.